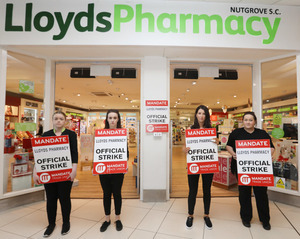 Lloyds workers and Mandate trade union members, top from left: Amy Bannon, Tara Flanagan, Deirdre Walshe and Debbie Kelly were among almost 250 mostly female workers in Ireland’s largest pharmacy chain to participatie in a third day of strike action until 1pm. 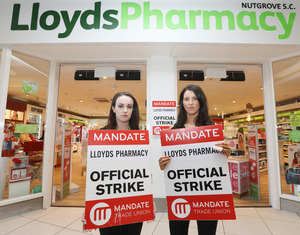 Lloyds managment declines to deal with Mandate preferring a Colleague Representative Council (CRC) to negotiate pay and conditions. Meanwhile, In Crumlin A1 At Lloyds? 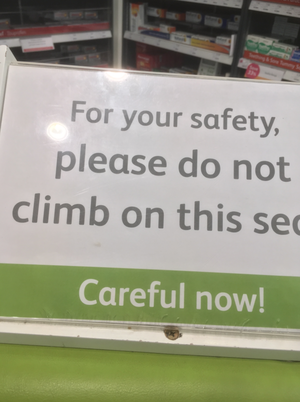 Posted in Misc and tagged Lloyd's Pharmacy at 3:08 pm on June 29, 2018 by Bodger. At least the scabs inside can get plasters. Well done ladies, stand up (literally!) for your rights. 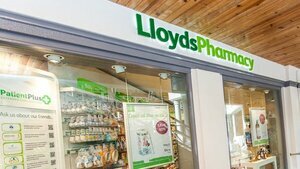 This is Llyods Pharmacy that tried to do the HSE out of €12,000,000 in bogus prescription fees a few years back. Ah yes Liam, you got their before me. Ripping off the HSE and thereby Joe & Mary public. Should Garda should have been involved? Are they striking for Gender Equality? The usual nonsensical begrudging comment from you.